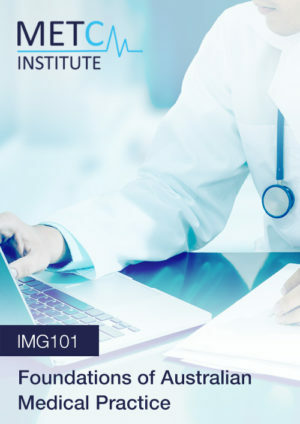 IMG102 develops advanced critical and analytical skills and methods needed for exceptional performance at the AMC MCQ examination through the use of multiple trial exams, each with worked solutions, strategies and references for further study. IMG102 is completed online through the METC Institute’s advanced Canvas LMS portal. It includes 10 full-length MCQ Trial Exams (total of 1500 MCQ’s). The course is supported by unlimited access to expert tutors, who are specialist medical practitioners that can provide guidance and clarification, individualised to personal requirements. This course allows candidates to develop and refine medical knowledge through problem-based learning, to develop exam strategy, to realise and attenuate weaknesses and to develop a higher level of understanding of the concepts required to maximise AMC MCQ CAT scores in order to transition into Australian medical practice. The Advanced Strategies for the AMC MCQ Exam Preparation Course (IMG102) is completed online over 5-10 weeks under the guidance of the academic faculty. Candidates work through each trial exam and undergo further study in problem-based learning format under the guidance and support of an expert academic faculty. 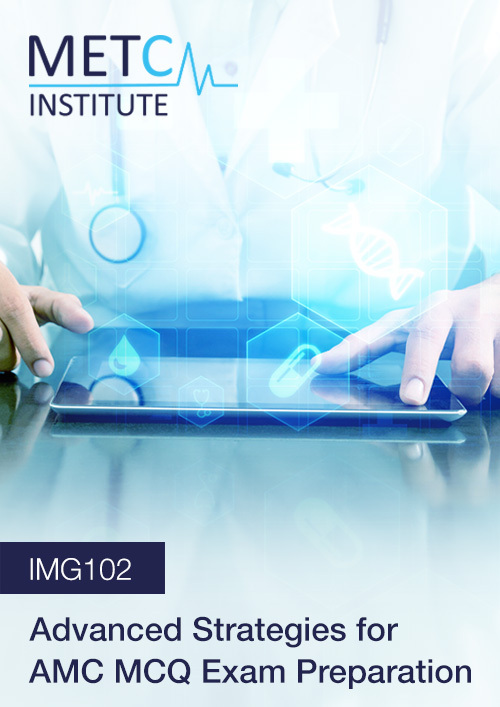 IMG102 develops advanced critical and analytical skills and methods needed for exceptional performance at the AMC CAT MCQ through the use of multiple trial exams, each with worked solutions, strategies and/or references for further study. This problem based approach to learning is completed online through the METC Institute’s advanced Canvas student portal. It includes 10 full-length MCQ Trial Exams (total of 1500 MCQ’s). These questions are reasoned within the context of the Australian health care system and candidates are directed by the academic faculty to further reading material that will consolidate knowledge in these areas. By completing this course, candidates will gain knowledge in the areas of pathogenesis, clinical features, investigative findings, primary and differential diagnoses and management of disease. The Advanced Strategies for AMC MCQ Exam Preparation Course (IMG102) is designed for international medical graduates who wish to pursue a future career in medicine in Australia. To be eligible to enrol in this program, candidates must have completed, or be in the process of completing an internationally recognised medical degree. For further information about eligibility, please contact us. The formal exit examination for this course consists of the Australian Medical Council AMC MCQ CAT examination. This examination is conducted and operated independently through the Australian Medical Council. The costs of this examination is not included in the course fees for IMG102. The Advanced Strategies for AMC MCQ Exam Preparation Course (IMG102) is designed and delivered by Specialist Doctors and Senior Lecturers from leading Australian University medical schools and teaching hospitals. Minimum qualification standards include MBBS with specialist qualification and registration with the Australian Health Practitioners Regulation Agency (AHPRA).